Select a Size |B x A| in the menu above. Spring guards can improve the safety of your cam unit or machine in operation by enclosing a die spring inside a metal tube. It can also protect the die spring from damage. 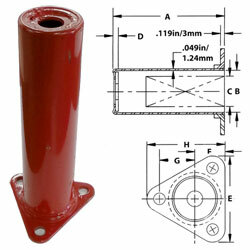 A spring guard can be installed around a die spring which is supported by a guide rod. Danly spring guards are made of cold rolled steel and have a painted finish. They can be used with inch or metric die springs. The available maximum spring diameters (B) are 1-1/4 to 2 inches (32mm to 50mm). The available lengths (A) are 3 to 12 inches (76mm to 305mm). Please contact us if you need a different size, or if you need us to make any alterations.